Mother’s day is the special day that celebrates motherhood and the most irreplaceable person in our lives. We think we all agree it should be cherished all year round and that a small gift from your huge heart can truly mark the moment. Are you on a budget this year? A cheap pearl necklace does not mean fake or cheesy. It actually means affordable! On the contrary, low priced pearl necklaces can be found across all types of pearls. This time we prepared a selection of cheap pearl necklaces that are considered the top accessory among pearl jewelry, as they can be dominant and most eye-catching since they frame your face and cannot be missed by anyone who is talking to you in person. You really don’t have to spend a fortune to organize a beautiful surprise for your mother or the person you cherish most. We offer pearl accessories at an affordable price, which is perfect for all people who are looking for that perfect gift and want to avoid minutes until midnight to get it. The most exquisite gift when it comes to jewelry is definitely natural pearls, developed in a seashell. Unlike artificial pearls, there are not two equal cultivated pearls, as each piece is unique and then, of course, can cost a pretty penny. And before we go on, we would like to mention that all our pearls are cultured pearls, including the cheap pearl necklace selections presented here. While they were commonly reserved as traditional accessories of our grandmothers, for the past several seasons, pearls are becoming more and more popular among younger women and are worn as an accessory to an evening gown, or even with jeans, simple shirts, and crop tops. Many celebrities combine pearls, even a cheap pearl necklace, with other materials such as gold, silver and even leather. So there is no strict rule to follow, you can go by them, around them or go ahead and break them, and have fun while doing it, and at the same time, you can advise your mothers to do the same, having some special time, creating memories and trying out something new! We prepared a small selection from our collection for this particular occasion. If you share a thing for jewelry with your mom, take the giving process a step further and order matching pearls and combine them with a similar outfit. Take some photographs and capture the moment … Keep on reading for some more bits of advice on how to prepare the perfect Mother’s day experience for the beloved women in your life. A traditional pearl necklace has always been considered a popular and sophisticated accessory with many clothing styles. According to Thilo Bruckner, a jeweler from a German association of jewelers, pearl necklaces today require a modern and contemporary style so it could easily target younger focus groups, by adding segments of gold, diamond, and other noble metals. Statistical data reveals that there is a connection between the size of pearls and their owners. Bruckner reveals that younger women rather wear the pearls that are 2-4 millimeters wide, while older and senior women go larger, approximately from 8 millimeters in width and more. Inspired by the upcoming mother’s day and celebration of women in general, we remembered the biographical movie about Margaret Thatcher “Iron Lady”, with the lead role played by Meryl Strep. From this movie, one particular scene took our attention. At the moment when Margaret accepted to become the Prime Minister of Great Britain, she decided to allow a team of media experts to change her complete style, from her hair, hat and even her accent. However, she refused to give up on her pearl necklace which she got as a gift from her husband after giving birth to their twin sons. In addition to wearing it as a symbol of her motherhood and strength, it can also be interpreted as an omen to her rise on the social ladder. There are many family stories that share a tradition from one generation to the next. Some women, like Margaret, never gave up on their symbols of motherhood. Pearls are and were considered a symbol of femininity, but are also the only type of jewelry for women who were in mourning and wearing black, allowed to wear, as they also represent tears. If they are not worn and not maintained, they will become pale, lose their shine and become yellow. According to some pearl lovers, this is when a pearl dies as it lost its shine and somewhat its purpose. – A Pearl Cleaning Kit that includes a special cleaning cloth that you should use only for your pearls, so they don’t become yellow and die, and never to lose their shine. So, apart from getting a cheap pearl necklace that looks as if you spent a fortune, you also get some nice free of charge accessories. When we mean cheap, it doesn’t imply that you can whip up a few dollars and get a high end all pearl necklace. With no intention to offend you, if you are looking for a perfect gift for your mother, we are assuming you want to invest a decent, but the affordable amount of money for those purposes. We have a variety of necklaces, pendants and other pearl accessories that range from a few hundred to a few thousand dollars. 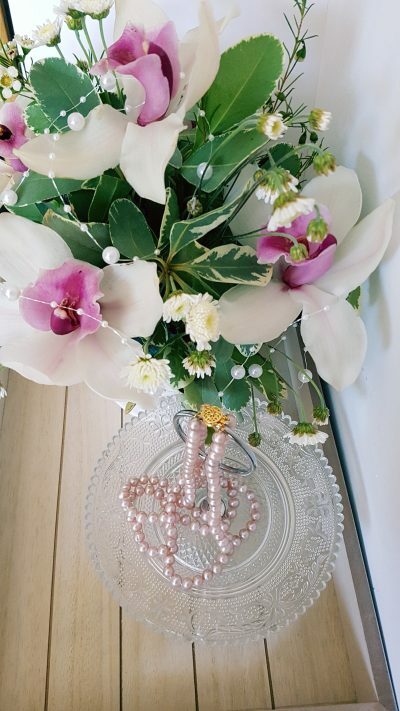 For these purposes, we chose a few pearl necklaces that are in the lower price range and are really affordable, but will still light up a smile of your mother, grandmother or other loved one. This is a classic white piece under $200. Each pearl is from 3-4 mm wide and is perfect for women who love to wear business suits or are old fashioned and are all about the tradition. Kind of like Margaret Thatcher, or other grandmothers that had that one set of pearls which they wore on special occasions, either way, these are a perfect and affordable choice for your mother. This affordable pearl necklace design will compliment a few dressing styles and necklines. The really cheap pearl necklace, in this case, should be worn with a strapless dress or any piece of clothing that leaves your neckline bare, the V shape visually elongates your neck giving your entire look an elegant and classic touch. It is also great for women who like to wear a classic business attire. You can even introduce the more recent styling trends to your mother and tell her to wear a turtle neck shirt or collar shirt and wear the necklace over the fabric. This is a slightly rounded version of the previous model. It has a more tender flow due to the round shape of the necklace. The five rows of pearls can present all the memories of the past, and those that are going to come with your loved ones, whether they are your mom, aunt, grandma our spouse. One of the benefits of choosing this pearl is the price, if you buy this particular piece through our website you will be saving over 80% of its market value! The most common styles that are combined with this shape of a necklace are a square and sweetheart neck. With square neck shirts or dresses, the rounded pearls will contrast the sharp lines and emphasize your neckline visually. When preparing it with the sweetheart’s neck, with straps, sleeves or bare shoulders, this necklace will give a small dash of tradition, class, and elegance to a somewhat vintage look that might even make your mother remember the fashion from the days when she was in her twenties or thirties. The smooth and elegant design of this piece is perfect for younger mothers or women who have a unique sense of style and like minimalist designs! The flexible necklace design allows the pearls to lay along your neckline following the natural contours of your body. With a simple one row of several pearls, you can take this cheap pearl necklace for a romantic outing, a date, and picnic or even for your day to day wear, and make it a bit more fun, creative and sophisticated, all at the same time. There is also a black version of this design, for those women who like to go away from the traditional pearl white ideas. Such low profile designs can go well with virtually all necklines because of their minimalist designs, so feel free to try out what suits best to your eye and taste- we guarantee you won’t make a mistake! Stepping away from contrasting and traditional colors, this simple and traditional design has a bit of a unique touch to the color of the pearls. The lavender has a soothing shine and effect and can be a perfect representation of serenity and security that others provide for their children. This piece requires some space and focus, so make sure your neckline is free to compliment it, or go modern and tuck it under your shirt collar that is contrasted to the color of the pearls, black, white or even navy blue. Tone it down with some black details and makeup that follows the shine and colors of the pearls. Like we already mentioned, there are no strict rules. It depends on personal taste as well as the style the owner of the pearl likes. Before choosing any pearl necklaces for the mother in your life, think about their style, colors, and preference. If you want to honor all of those life memories of hardships and joy, choose a necklace that has a few strands of pearls. If they have a unique and artistic style, think how to incorporate a necklace design into a contemporary outfit and make a learning experience for your mother by taking her shopping for the perfect outfit that will be topped off with a gift wrap containing her new set of pearls! There is no doubt that we are always looking for ways to top off our last year’s gifts and surprise our mothers so they feel happy and accomplished when watching us grow as children to adults, and mature along in life. Sharing these experiences is a gift that both of you share. Offer an unforgettable gift this year and pick one cheap pearl necklace that values a fortune. However, if you want to really show them your appreciation try making their mother’s day experience special in a way they feel appreciated not just as a mother, but as women that deserve to feel beautiful and appealing to herself and others. If you have time, prepare some breakfast for her and surprise her early morning in bed. Organize an entire day of sharing new experiences and learning together, take her shopping and get matching outfits, and finish the day off with a fancy elegant dinner or other events that would be appropriate for your mother to show off her new pearls!